Don't judge this bar by its appearance. Taboo Lounge’s location (amid a sea of bail bond companies) and appearance (a dark exterior and heavy wooden front door) is enough to give anyone pause. 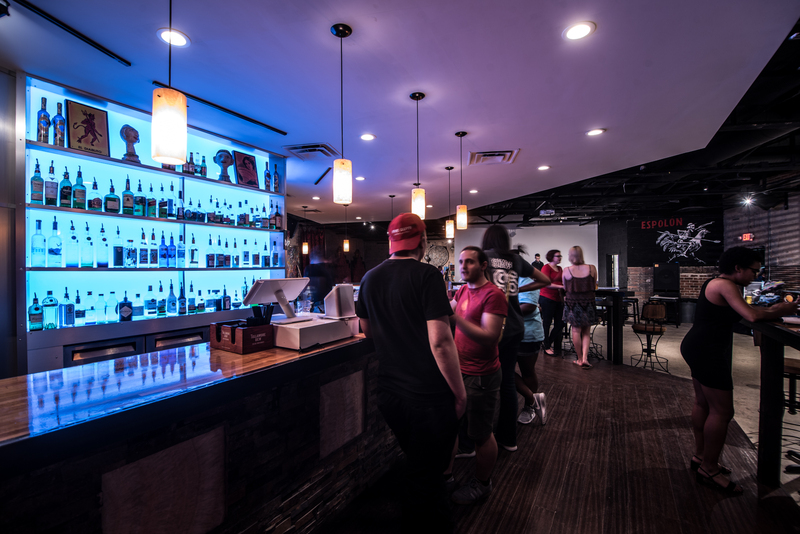 But if you take the plunge, you’ll find that this lounge is an awesome, chilled-out space with an ultra-friendly staff and a rotating schedule of art shows, karaoke, and live music. The bar’s walls feature work from local artists. 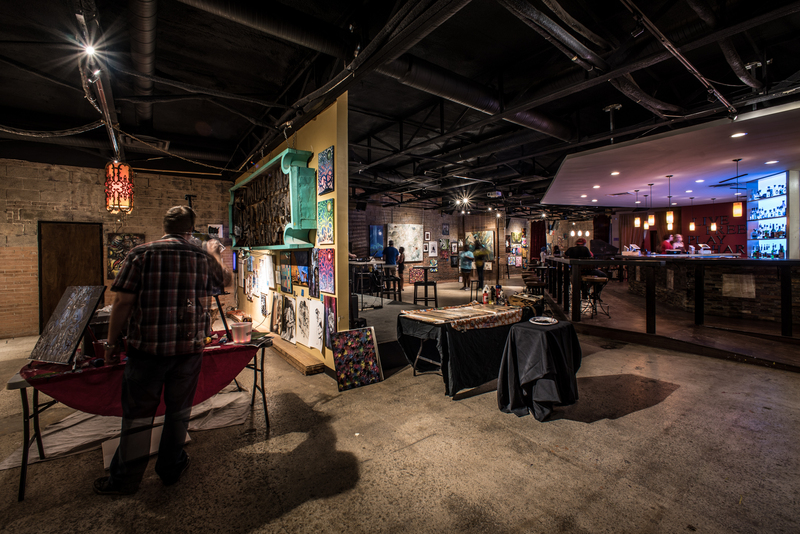 The Atmosphere: Taboo Lounge is an eclectic speakeasy with an eye for art. There are Grecian statues near the front entrance, a stained-glass window in the back, and local artists’ work blanketing the walls in between. The main space features exposed brick, ample seating, a well-lit bar area, and a healthy sized stage. Consider this lounge the kind of place that your coolest, most artistic friends would hang out. Gothic banquettes and glowing red tables frame a wall near the back of the space, where you’ll also find two small hang-out compartments: there’s a back room with a cocktail bar, and an alcove behind the stage that’s also home to a motorcycle. Though the place opened in November, the new bar manager told me they’re working hard to redefine Taboo’s identity. In the meantime, consider this lounge the kind of place that your coolest, most artistic friends would hang out. What to Order: Taboo has 20 taps that usually vend a mix of local brews, and though they don’t yet have a cocktail menu, the bar manager is more than happy to whip up a little something special for every guest. 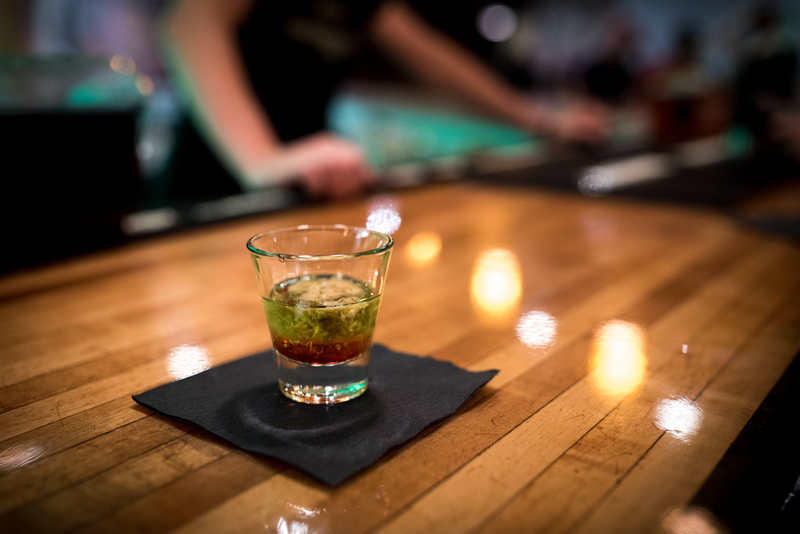 (“If you like fruity drinks,” he told me, “I can make something that’ll knock your socks off.”) If you need a suggestion, order his specialty drink: The “Naked Shakespeare” is a gothic-looking fruity rum drink that’s sure to become a signature favorite. Although the bar doesn’t have a cocktail menu yet, the bartenders are happy to create one at your request. Taboo Lounge has 20 taps that usually vend a mix of local brews. What I Didn’t Like: I wanted to know more about this place before I stopped in, but there’s very little about it online (there’s a Facebook page, but its current website is just an unedited WordPress site). Due to the location, it’s not the kind of place people will just stumble into, so I think it would help to have an updated, accessible website that clearly defines all the fun stuff Taboo has going on. What I Did Like: It’s offbeat, arty, and full of interesting, goth-tastic décor. Plus, “Poison” by Alice Cooper was playing when I walked in.